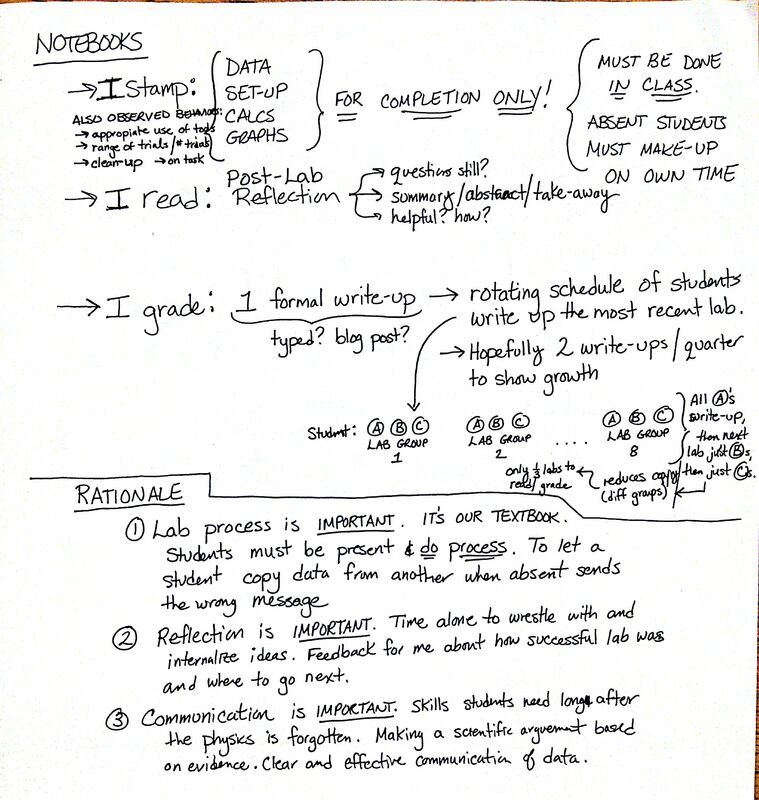 Day 158: Labs, Notebooks, and Reports: For What Purpose? NOTE: This post was reblogged from Action-Reaction, my main blog. Today was Senior Seminar: a day-long school event where seniors get breakfast, BBQ lunch, yearbooks, and attend workshops about upcoming college life. So all my seniors were not in class today, which gave me some time to reflect. I was thinking about how best to use lab notebooks and lab reports next year. I’ve gone through various other incarnations of notebooks, reports, whiteboards, packets, etc. in my 15 years of teaching. My handwritten reflection for what to do next year are below. I think it captures the best of all those previous systems while still maintaining a reasonable workload. I stamp the lab notebooks during class as evidence that the student was present in lab and participating — brief design, measured data, calculations, and graphs. These are the things that will be identical from noteb0ok to notebook anyway. I won’t be picky about proper format because I’d rather have them spend most of their time taking and analyzing data than worrying about it looking picture-perfect. Also, students who are absent would be required to come during a free period or after school to perform the lab. I’ve never done this before. It could be overwhelming. But I also think it sends the wrong message to a student that they can just copy the data from a partner. Students write a post-lab reflection. After we’ve had our post-lab class discussion to tease out the concepts, idea, models, relationships, etc. from lab, I’d ask students to summarize what they’ve learned, what questions they had, and what they found to be (in)effective about the lab. I wouldn’t grade this either, but I think taking the time for solo sense making and summarizing is important. This could be done on an exit ticket, in the notebook, or online. Students write a formal lab report. I think that effective communication of a scientific experiment is important. My failure this year was trying to do it simultaneously in the notebook. How to make a table and graph and put it into a report is an important skill. How to best represent the data is an important skill. How to make a scientific argument based on evidence is an important skill. But reading 50 lab reports about 6 times per quarter is awful. So I’m taking a cue from my freshman writing professor. He set up a rotating schedule in which just a few students submitted an essay each week, based upon one of the books we had read. I think doing it this way would lead to fewer reports to look at each week, thereby allowing me to give more effective feedback. Plus, I’d have fewer copied reports since I’d have just one student from each group-turn in the report. So if there are 3 students in each lab group (A, B, and C) then all the As would turn in a report one week, all the Bs the following week, etc. Hopefully the schedule will allow for 2 write ups per student each quarter in order to show growth.